Doug, that's an incredibly weak argument. Who's going to draw attention to their incorrect predictions? They get conveniently forgotten, and we are left with amazingly accurate forecasts. It's like a bankrupt gambling addict telling you about his big wins. @mistermack: "Archie, if the evidence was as overwhelming as you say, I wouldn't waste my time looking." The fact you are "still looking" doesn't affect the quality of the evidence in now way. I'll surmise that the reason you are still looking is that you have failed to understand the science, probably because you're too biased towards your preconceived notions to be receptive to it. Again, the evidence is there, and you have yet to present a convincing claim against it. "I know for a fact that the evidence is debateable, because I've done a lot of looking, much more that the average student intake." That's argument by assertion: "I'm right because I say I am." Sorry, but that logical fallacy won't cut it here. "I think I am therefore well justified in my conclusion that most people are initially convinced by the "consensus" rather than evidence." No, you're not. You haven't presented a shred of evidence to support your accusation. Therefore, the only think we can conclude is that you don't seem to know what you're talking about. "You mention doctors, but many doctors are also homeopaths, and many are "experts" in homeopathy." That's an attempt at changing the subject, and in fact *very few* medical doctors are homeopaths. Medical experts, and the current state of medical science, condemns homeopathy as the hoax it is. "The concencus of experts in homeopathy would be overwhelmingly supporting the effectiveness of homeopathic remedies." Homeopathy is not empirical science, and the vast majority of medical experts do not accept homeopahty and its alleged remedies are effective. So your example fails. Again, that is not a valid examples, because chiropractors are not necessarily experts in medical science (and in fact I suppose very few do). These examples fail to support your anti-intellectual attack on experts. "I'm not saying that climate science is as silly as these,"
No, but you're certainly implying they are similar. "I'm just pointing out that a consensus is naturally self perpetuating, till it's disproved." Again, there is no indication that people who study climate believe in AGW because of the consensus. Rather, the consensus exists because the evidence (which you *choose* to ignore) indicates AGW is very likely true. "That's why the consensus on AGW is totally valueless, as evidence." Well, that's right in an of itself. Note that the article isn't claiming that the consensus is evidence AGW is true - it doesn't. Rather, it is a rebuttal of the contrarian argument that "there is no consensus," when in fact there is (as you yourself have admitted a few times in this thread already). So, again, the contrarian argument is that there is no consensus (hence such farces as the Oregon petition project), the rebuttal is that there is. You arguing that the consensus is meaningless is off-topic (and wrong in your characterization of the consensus). Please stop insinuating that people who study the climate are motivated by groupthink rather than rational thought. It's insulting, and goes against site policy (as it suggests a conspiration of dunces). "In climate science, you can't even predict next year's trend. But you can grandly predict the trend for the next century." "Without the slightest risk of being proved wrong." Archie, your link, "evidence is there" just illustrates my point perfectly. The relevant question is the sensitivity of the climate to CO2. Will increased CO2 cause a big enough rise in temperature to cause problems. That's the one bit of evidence missing. The relevant bit. The rest is just window dressing. I didn't say there is no evidence about anything. I'm saying that you need evidence for the central tenet. Link me that, if you like. Archie, your page from the "know nothings at NASA" showed evidence of warming. We all know we've had warming. What's not there is good evidence for the title "anthropogenic". That's what's always missing. @mistermack: Climate Sensitivity is estimated at between 2.5C and 4C. If you have evidence to the contrary, by all means present it. So far you have failed to do so. As for the NASA page, it clearly shows the current level of CO2, and we know CO2 "greenhouse gas" properties will increase temperatures. We also know this extra CO2 is from anthropogenic sources. Therefore, it is very likely humans are responsible for the current warming. Again, you have failed to produce a single piece of evidence that disputes this. The burden of proof is on you - better start working on that thesis! 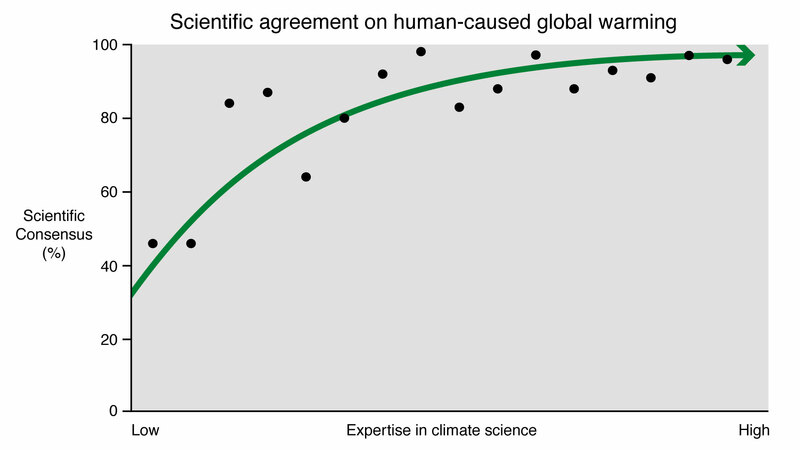 At least you agree it's warming, even if you're ready to gamble civilization's future just because you disagree (without evidence) about climate sensitivity. Please read Lean 2010, and look at figure 6. Responseman, I looked at "Climate sensitivity is low", the first sentence is :"There are some things about our climate we are pretty certain about. Unfortunately, climate sensitivity isn’t one of them". That makes my point for me. The "consensus" is there, in spite of the lack of certainty about the central tenet of AGW. That is, is the climate sufficiently sensitive to CO2 for there to be a problem? I argued that the consensus is fortified by the consensus in a feedback loop, not by certainty of the evidence. I did read more. I noted that it's claimed "we know that....." without saying how. I don't want to get off topic, but a model doesn't justify "we know that", you could maybe say "we calculate that...." or "our best estimate is....."
What this seems to indicate, is that the "consensus" is basically the result of faith in models. Yet others are telling me that they think it's the result of evidence. I still think consensus has built itself up in a feedback loop. Response: Why on Earth do you think all the evidence is in this blog? The authors of these blog posts go to considerable trouble to cite, and when possible link to, the peer reviewed scientific literature so that blog readers can go there if they want more info. Commenters responding to you have done the same. It's past time for you to take advantage of those resources. I'm replying to the link you offered me. It hardly follows that I think all the evidence is here. I politely read the link you offered, and responded. Perhaps that's a suggestion. A page called "here is the best evidence for AGW" (or maybe I've missed it). I would take it as read that we've had warming. (only the warming since 1950 should count, since CO2 rises were completely insignificant before that). So a page with nothing but evidence linking manmade CO2 to the warming since 1950 would be absolutely brilliant. @mistermack: "A page called "here is the best evidence for AGW" (or maybe I've missed it)." I already pointed towards it. Now, if you could indicate which information on that page is inaccurate (with evidence, which you keep asking for but never provide to support your own claims), that would be appreciated. Response: Also, mistermack, when on any page you see blue text, you should click on it, because it is a hyperlink to more information. And look past the end of each original post, because often there are green boxes with links to further reading and to related Skeptical Science posts. #242: "most "experts" are apologists for the concensus:"
Let's accept that philosophy for a moment, postulating that it must work both ways. So W@tts and G*ddard and Jo#ova and all the other so-called 'experts' who've bought into the consensus (31000 scientists agree) that AGW is a scam are mere apologists. You can't have it both ways. But in reality, I would rather live in a world that values consensus among experts -- or at least one that values expert discussion of disagreements with logic, observation and sound science rather than name-calling and petty vitriolics. Because this is what you get when there's no consensus. Responding to Response to 261, I looked, it doesn't contain any evidence of a human link, but I clicked on the fingerprint link, to the "it's not us" argument, which is probably the closest to an evidence page as there is. It's good reading, a lot more relevant than anything else I've found on here. At the end of the day though, the evidence still boils down to models, models of where the warming should be detected, followed by this is the warming we detected. ( etc ). If you accept the models are true, you can claim plenty of evidence. If you regard the models as needing confirmation, then the evidence needs confirmation. I can't help but conclude that the models were inspired by the data, so you shouldn't call it evidence if the data matches the models. If the consensus is the result of the evidence, then it seems to depend on the data and the models matching up, which is hardly surprising. @mistermack: not all evidence rests on model, some can be directly observed and/or reproducible in a lab (the actual greenhouse properties of CO2, for example). Similarly, the fact that we are increasing the concentration of CO2 in the atmosphere can be determined without resorting to models. Now, as far as models go: you're welcome to demonstrate how the models are inaccurate, and produce your own models to explain the observed data. Until then, don't be offended if I'd rather accept the actual science presented on this site rather than the vague allegations and half-baked arguments you keep throwing around. In the meantime, why not check out the Models are unreliable page? Isn't the important consensus the following: That the earth is warming, man is a significant cause, *that the problem will be serious if nothing is done about it AND the proposed actions (e.g. Kyoto protocol, Cap and Trade, Copenhagen agreement) will prevent the problem from happening? * What % of published climate scientists would answer yes to that question? The majority of climate scientists I've heard opine on the issue of the effectiveness of any of the proposed solutions is that they won't stop the problem from happening. #268: "The majority of climate scientists I've heard opine on the issue of the effectiveness of any of the proposed solutions"
Sounds like you already have your own answer to the question you posed. Is a difference of opinion sufficient reason for doing nothing? You could consider looking into the question here and here to learn something about it. If you want to engage in a serious discussion, you should also give specific references to the 'climate scientists' whose opines you are following. Helps to know what your sources are. ...then I'm of a similar mind. I've always liked Hansen's position on fee & dividends, but I suspect it too doesn't go far enough to forestall CO2 emissions quickly enough. Your STATS survey of climate scientists is a bit dated now. In light of current events, most on the fence will be re-thinking just how uncomfortable that position has become. #270: "if you're going to use consensus as argument"
The consensus in question in this article is "demonstrated by the number of scientists who have stopped arguing about what is causing climate change – and that’s nearly all of them." Thus there is general agreement among serious scientists that global warming is happening and we are causing it. "you have to have consensus on the important part of the issue - what to do about it"
That's a separate question and wildly off-topic. The Hansen op-ed you linked in #270 calls for stronger measures than cap and trade: "There is a better alternative, one that would be more efficient and less costly than cap and trade: 'fee and dividend.'" However, in the US, conservative talking heads have basically killed any hope for any action with their 'cap and tax' hot air. Don't conflate lack of consensus on what to do, which is mired in political rhetoric, to consensus over what is happening. If you want to continue discussing what to do, go to Solving global warming. Based on current trends, 41% of scientists believe global climate change will pose a very great danger to the earth in the next 50 to 100 years, compared to 13% who see relatively little danger. Another 44% rate climate change as moderately dangerous. That's 85% in the moderate to very great danger camp. Makes you think that the folks shouting down any ideas for change are the ones causing the problem. Which side are you on? Yooper, I also have some earth sci degrees somewhere in my distant and checkered past. Knew there was something I liked about you. BTW, consensus is an ever-evolving narrative, adapting (one way or the other) to emerging understanding over time. Much has become known since 2008. That makes the study you cited dated. As my one lone example showed (had you read the link). "Yooper, I also have some earth sci degrees somewhere in my distant and checkered past. Knew there was something I liked about you." Early 80's, Central Michigan University. #274 - Claims of settled science and scientific consensus have been around since at least 1989 - here's a reference from the NYTimes. But NOW, there REALLY IS a consensus. I see. Response: Please refrain from using all caps. Use italics or, if really necessary, bold.
" "Do you think human activity is a significant contributing factor in changing mean global temperatures?" (Doran 2009). … 97.5% of climatologists who actively publish research on climate change responded yes." That is exactly 75 people. @NQoA: what's your point, exactly? That we should trust experts on a particular matter because there's relatively few of them? I know deniers usually aren't motivated by logic, but you sir take the cake. I wonder if the "consensus" among AGW supporting scientists is the basic need for government subsidized studies of the supposed "problem?" Response: [Daniel Bailey] Please refrain from expressions of ideological bias; stick to the topic of the post. Off-topic comments will get deleted. Thanks for your compliance! Interesting news, identifying how some of those non-consensus scientists get their funding. Dr. Patrick Michaels of the Cato Institute testified that widely accepted scientific data had “overestimated” global warming and that regulation enacted in response to that data could have “a very counterproductive effect.” ... In its “Morning Energy” column, Politico described a CNN appearance by Dr. Michaels in which he gave “40%” as his estimate of how much of his funding comes from the petroleum industry. But that would never compromise their opinions. Interesting! with that in mind, what is you opinion concerning the "petition project" signed by some 31,000 scientists stating, "there is no convincing scientific evidence that human release of carbon dioxide will, in the forseeable future, cause catastrophic heating of the Earth's atmosphere"? #282: "concerning the "petition project"... "
See the thread on the very same petition project. When the petition first came out, I checked some of the names: Quite a few dentists, pediatricians, astrologers, people who had taken a science degree and then gone on to business school or law school ... even some who were deceased at the time. Yes, I'm well aware of the lack of credibility of the "petition project" list. That's why I asked the question in light of the statements in #281. I wanted to see if he supported the "petition project" but not the Doran study. Or perhaps I misunderstood what he was suggesting. As a person who tries to keep informed about the Climate Change issue, I can't help but view the pro-AGW group as the early 15th century Holy Roman Catholic Church, and the anti-AGW group as Galileo. As an outsider, I also shake my head with dismay as this whole science has become a moving target over the years. The earth is warming and that's a fact. Oops the upper levels of the atmosphere aren't warming. Ahem, well that is part of our theory, yeah it really was. Oops, only the troposphere at the very lowest levels is supposed to warm. Yeah, that's the ticket. Oops, these temperature levels are declining. Ok, let's manipulate the data to “hide the decline” and attack all the deniers and rename it "Climate Change." Ok, it is going to get so hot, that it really cooling off. Look folks it is so complicated that only the truly smart can understand climate change. Who are the truly smart? Well, they are whoever we say they are. Climate Change is what we say it is. NA #285 Thank you. If you spend too much time looking at the evidence for AGW it can sometimes become a little depressing but your post made me laugh out loud. Thanks, Neobot. Of course, the crucial difference is that Galileo had evidence and all the Church had was faith. It's also not so complicated nor so filled with doubt. Oh, and just in case you are actually human, Neo, perhaps you'd like to read and move your comments to a more relevant thread. I think you are misinformed on a few of the topics. Regarding you issue with "hide the decline", the decline is not in the temperature record but rather in the divergence in the tree ring record. You'll find a good summary of the issue here The temperature record using modern instruments have shown very good agreement, and have with stood independent reconstructions. See here for details. In fact recently the BEST project ran by Richard Muller, who is hardly pro-AGW, showed agreement with the other temperature series. "The East Anglia emails show the extent that pro-AGW group will go to hide dissent. (The application of pressure on journals to fire editors who dare to publish contrary opinions: the modern day equivalent of burning heretics at the stake)." Here is a good summary of the issue surrounding the allegation. "Look folks it is so complicated that only the truly smart can understand climate change." This cannot be farther from the truth. While some aspects are no doubt highly technical, the theory on the whole is very approachable. What is required is the patience to go though all the details, because a LOT has been done. Most of the skeptics "objections" you hear nowadays is nothing new, and they all have been considered at some point (some long time ago). Neo Anderson wrote : "As a person who tries to keep informed about the Climate Change issue..."
Unfortunately, everything you typed after those words shows that you have failed in keeping yourself informed, except in as much as you seem to have 'informed' yourself via the medium of websites of denial, misinformation and disinformation. Actually Galileo is more cited than known. I'd invite to study history a bit more in depth before making any analogy. Should we consider this as a modified version of the famous Godwin's law? Neo... Your post begs the question, where are you trying to keep informed on climate change issues? There's actually a name for this tactic, it's called the Galileo gambit. That's a good one, e. And, having read your link, I was distracted by another link there : the Chewbacca Defense. I think we have seen that over on the 2nd law of thermodynamics contradicts greenhouse theory thread, including the related Chewbacca Dilemma, as shown by those trying to explain the facts to those who don't seem to be able to understand them ! Also #287, you can watch videos on YouTube of AGW scientists such as Mann, Hansen, etc… getting in arguments over exactly what the consensus is. #289: It is documented that weather recording sites were moved from the open country to city parking lots. There was apparently much frustration at the lack of temperature increase in much of the southwestern United States. I guess it has now proven that parking lots and rooftops are much warmer than the countryside. Years of potential valuable data was destroyed. A few of these sites can be viewed at norcalblogs. Also #289, I agree that the “objections” were looked at some point in the past. However since they were contra-AGW, they were dismissed. After awhile there is so much contra-evidence that I don’t feel it can be ignored. Scientists who consider all of the evidence are labeled as deniers and ridiculed. Would you please list just one study that is accepted by the consensus that contradicts AGW. Response: Please note this site's Comment Policy before posting. Comments are expected to stick to the science and remain on topic. This ensures that the debate remains civil and scientific. The topic here is the scientific consensus regarding AGW. If you wish to discuss the reliability of the temperature record, you can do so in the Temp record is unreliable thread. Future comments in violation of the policy will be edited or deleted. "Because I dare read information contrary to the “consensus” I am a heretic"
No, your posts here do bear remarkable resemblance and have the hallmarks of a troll, and probably violate the house rules Might I suggest you please go back to WUWT or wherever else you have been obtaining your misinformation and anti-science snippets. And for the record, this is my first and last post to you. Neo#297: "My point was that the church had the consensus"
Consensus of what? Consensus of 'this is the way we say it is'; that;s not scientific argument. So that's a nonsensical start. "AGW has become its own religion. It has to be taken on faith." And now a descent into the ridiculous; this is called science, not faith. It is far more of an act of faith to blindly accept that AGW is not happening. Go to WUWT and proclaim otherwise; you will be quickly persecuted. Tackle any anti-AGW argument with scientific argument; you will find 'No, its not' is all that's left. So stop the bogus, self-defeating arguments. You'll have to do lots better here. Neo@297 A point to ponder, if reading information contrary to the "concensus" makes someone a heretic, surely that means all the RealClimate chaps, every contributor to SkepticalScience, Tamino etc. are all "heretics" - there is plenty of evidence that they have read papers by contrarians - how else could they debunk them. No, Neo Anderson : the church backed a Ptolemaic Model which, although not universally accepted was mathematically provable, and that took the work of several geniuses (including Galileo) to finally discard. Where are those geniuses against AGW ? And where is faith involved, apart from the faith involved in believing that the problem is anything but AGW ? How much proof do you need before someone like you will accept it ? What videos are you referring to ? Where is the documentation you refer to ? Where is the "contra-evidence" ? Which scientists are you referring to ? What "contrary information" do you have ? Who called you a "heretic" ? Did you go to, and read, any of the links you were provided with ? As for your question : "Would you please list just one study that is accepted by the consensus that contradicts AGW." That is strange logic. Let me put this question to you : ""Would you please list just one study that is accepted by the consensus that contradicts Evolution." If you can't, does that mean that Evolution studies are biased against the Creationists and therefore a sham ? Neo Anderson @ 297... Just because you informed yourself does not mean you have informed yourself with accurate information. Thus my question. Where are you getting your information? Generally, on this site, people cite their claims with links to the information so others can review it for accuracy. Regarding your church analogy... You have to remember that this is science. Science is based on the empirical evidence that has been presented into the literature. When you go to the doctor and get an opinion about a condition you may have, you are generally getting what the "consensus" of most doctors is. You can choose to ignore that and find a minority opinion on your condition if you like. My bet would be with the consensus opinion. 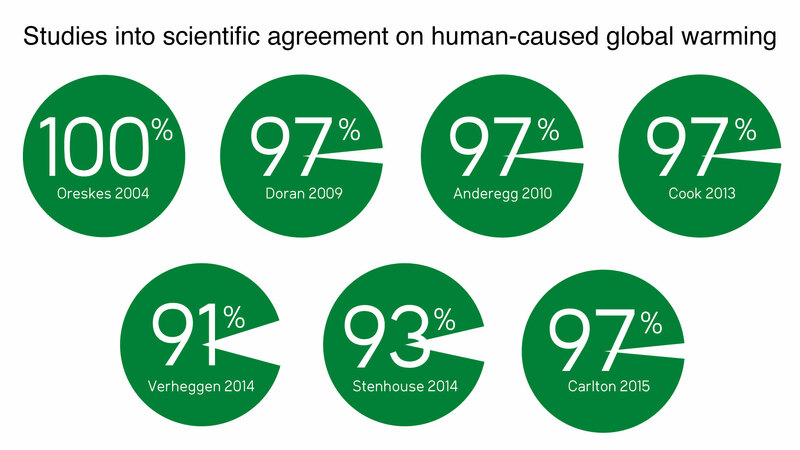 The fact remains, the "consensus" on climate change is there and it is robust. The available evidence is overwhelming. It could be wrong, of course. But the chances that it's wrong are vanishingly small. No faith required here. The empirical evidence is fully available. Regarding the UHI effect, it has been shown that it doesn't affect the temperature anomaly record. In fact NOAA did a study compared to the ones classified as "good" or "best" according to Anthony Watts, and showed that there is no difference at all. What that implies is that the UHI effect does not create a warm bias. For more details on UHI, I think you should read this , and I am sure people would be happy to have a discussion with you over there. Regarding data distruction, you'll have to be more specific. Regarding alternative theories, they are not dismissed simply because they are contra-AGW, but it is because either they are flawed, there are no supporting evidence, or evidence directly contradicts the theory. On skeptical science you will find a very detailed catalogue of alternative theories, and why they don't work. Most of the "evidences" touted by skeptics are often misconstrued facts, or simply irrelevant to global warming. In addition, scientist that raise scientifically sound objections are always taken seriously in the research circle. It is only when scientists who do not do research in climate brings up points that have be refuted many times that they run the risk of being ridiculed. It gets tiring afterall. "Would you please list just one study that is accepted by the consensus that contradicts AGW." Off the top of my head I remember: Lindzen and Choi 2009 that challenges climate sensitivity. Henrik Svensmark is still publishing on solar cycle-cloud link. Mind you there are only very few of them, precisely because there aren't a lot of scientifically sound alternative theories left.